Friends v Alton Social B.C. On Sunday 23rd July, on a damp Sunday lunchtime, the Friends team arrived to be greeted by a sumptuous buffet lunch prepared by the ladies of Alton Social B.C. in Hampshire. 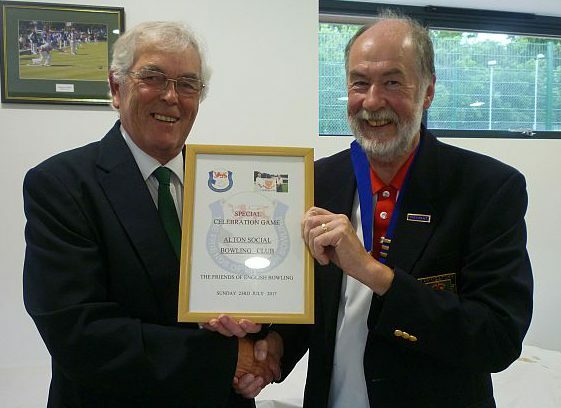 The club has recently re-located to a new green, clubhouse and car park and the match against the Friends was the first of two matches arranged to celebrate the opening of their new complex. When the time came to start the match, the weather decided to intervene, and although we managed to complete the photographic evidence of our visit and carry out the pre match formalities under the shelter of a large umbrella, heavy rain forced a retreat into the clubhouse before the match could commence. Fortunately, there is a six rink indoor club right next door to the outdoor green, where many of the Alton members play in the winter, and arrangements were swiftly completed for the match to be played on the indoor green. Although the score was quite close during the middle part of the game, home advantage told in the latter stages and Alton Social ran out victors by 15 shots. 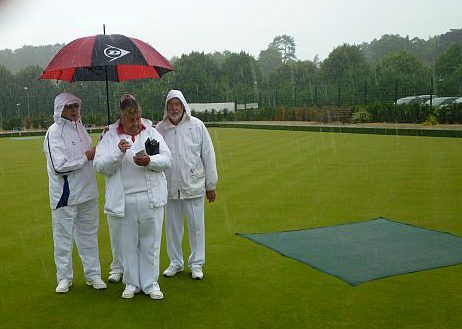 It was disappointing not to have the opportunity to play on the new outdoor green, but listening to the rain pounding down on the roof while we played indoors made even those who do not play bowls indoors grateful to be dry and warm rather than wet and bedraggled outside. After the match we were treated to an excellent salad meal and dessert, and with honours fairly even in the raffle that followed, everyone set off for home feeling that bowls and new friendships made had been the winner rather than allowing the rain to spoil an excellent occasion. Thanks are due to everyone at Alton Social who worked hard to entertain, feed and provide us with liquid refreshment, to Chawton Park Indoor Bowls Club for allowing us the use of their facilities and to the players who travelled from seven counties to represent the Friends.